Q: I’m coming in for a Brazilian and I am nervous! What should I expect? A: First off, don’t be nervous! We try to make it as fun and stress free as possible. 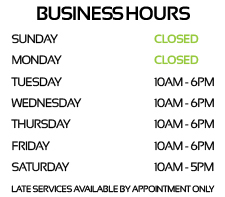 If for some reason you aren’t comfortable during your appointment, we can stop and clean you up at any time! If you choose to take a couple ibuprofen to help with the discomfort, feel free to do so. We do not recommend taking any other medication for pain or consuming alcohol before your appointment because it can thin your blood and make the waxing process a little more difficult for your esthetician. Q: How long does my hair need to be to wax? A: For facial waxing we need at least 1 to 2 weeks of growth for a good wax. Also please make sure you aren’t using or are taking a break from products like Accutane, Retin A and other topical treatments that are derived from vitamin A that can thin your skin. For the rest of the body we need a minimum of half an inch of hair to work with. If you feel that yours has grown out too much, you can trim it down to a half inch length before your appointment. Another thing you can do to help ensure a thorough wax is to exfoliate the day before you’re scheduled to come in. It helps break away dead skin to free the hair for a proper wax. Q: This is my first time getting a wax “down there”. Which service should I ask for? A: Ok, here’s the run down right to the point. For both men and women we offer bikini, extended bikini and Brazilian waxing. The bikini wax is just the front bikini line. Extended bikini is the front and the crack. Brazilian waxing includes everything. The pubic area, labia/scrotum and the crack. Q:Do you have a cancellation policy? What if I need to reschedule? A:SKIN. Day Spa has a 24 hour cancellation policy. When you call to book an appointment you will be asked for a credit card number to hold your reservation. Missed appointments and cancellations less than 24 hours in advance will be charged to the credit card provided for 50% of the service. When you make your reservation we expect you to be here unless we hear otherwise from you. Rescheduling your appointment before the 24 hour mark is fine. We understand that people get sick and emergencies happen, so communicating with us is always important! Q: I’ve never had a facial before, what kind should I book? A: If you are unsure of which treatment is right for you, it’s best to book a 60 minute SKIN. Signature Facial. We will customize everything based on your skin type and an intake form that you will fill out for your appointment. You can also book a 30 minute express treatment, but it doesn’t include massage and gives less time for extractions, exfoliation and masking. Q: Is it ok to talk to my therapist during my facial or massage? A: Absolutely. This is your time and we want you to be comfortable, so we will follow your lead. You can chat during your entire session or you can relax in silence. During a massage your therapist will check with you to make sure the pressure is comfortable for you, and we strongly encourage you to voice at any time if you would like more or less pressure. During a facial there may be times when a product isn’t feeling like what you expected or the steam is too warm, etc. These are also instances where we want you to let us know! Q:I don’t even know what products I should be using on my face. Help! A: We are more than willing to guide you properly in the vast and sometimes confusing area of facial and body products. Before your first service we will have you fill out an intake card. We will discuss previous treatments you have received and what you are currently using. Our therapists will do our best to educate you about your skin and what you can do to make it better from the inside out. Q: What does a body treatment consist of? A: Body scrubs and wraps can be added to any massage. We will have you undress to your comfort level for your treatment. Disposable boxers and bikinis can be provided. We will then apply your scrub or wrap and let you relax. When it’s time for the product to be removed we will have you step into our wet room to shower everything off. Then you will return to the same treatment room to enjoy your massage.